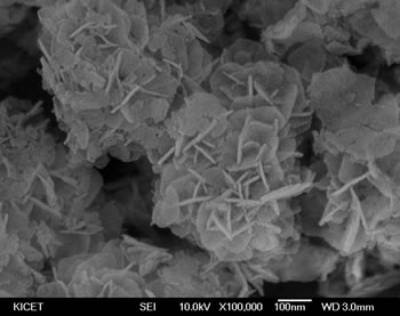 Layered double hydroxide (LDH) is a class of ionic lamellar solids with positively charged layers with two kinds of metallic cations and exchangeable hydrated gallery anions. This is also referred to as anionic clays and also as hydrotalcite-like compounds in the name of the polytypes of the corresponding [Mg-Al] based mineral. Interest in hydrotalcites and derived materials arises from the wide applications: catalyst supports, processing of selective chemical nanoreators, separation and membrane technology, filtration, scavenging and controlled release of anions, electroactive and photoactive materials, etc. 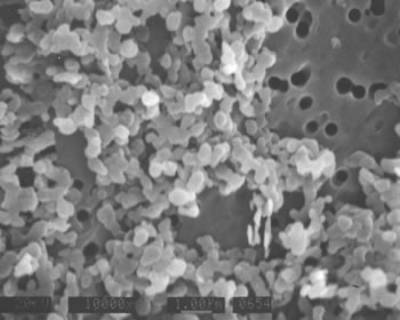 Hydrotalcites as an acid scavenger to inactivate residual catalysts in synthetic polymer is commercially available, where particle size and shape as well as anion exchange capacity are the properties interested in. In this study, Mg-Al- LDH were synthesized with final Mg/Al ratio of 2~3 by co-precipitation method. Effect of synthesis parameters, such as concentrations of starting material, method of mixing Al and Mg sources, ageing, crystallization, and drying conditions, on their structure, morphology, and physical properties were studied. Especially the correlation of crystallinity, morphology, and particle size to anion exchange capacity were examined. Thermal and dehydration/rehydration behaviour was studied by thermo-analytical methods, Thermo Gravimetric-Differential Scanning Calorimeter and Thermo Gravimetric - Mass Skimmer Coupling. The structure of materials was characterized by X-ray diffraction and Fourier transform infrared spectroscopy. Particle properties, morphology and particle size, were characterized by Scanning electron microscope, particle size analysis, and Brunauer, Emmett, and Teller (BET) measurements. Layered double hydroxide(LDH) is a class of ionic lamellar solids with positively charged layers with two kinds of metallic cations and exchangeable hydrated gallery anions. This is also referred to as anionic clays in comparison with cationic clays and also as hydrotalcite-like compounds in the name of the polytypes of the corresponding [Mg-Al] based mineral. LDHs with different cations, such as Mg, Mn, Fe, Co, Ni, Cu, Zn for divalent cation and Al, Mn, Fe, Co, Ni, Cr, Ga for trivalent cations, and LDH derived materials have been studied and possible wide applications have driven strong attraction as anion exchangers, polymer stabilizers, antiacids, anion scavengers, catalyst supports, adsorbents, filtration, controlled release of anions, electroactive and photoactive materials, etc. However, Mg-Al-LDH is commercially available  as an anti-acid agent and filler as anion scavenger in organic polymers to capture residual halides after use as polymerization catalysts. Hydrotalcites, which has general formula of Mg6Al2(OH)6CO3⋅4H2O, is the first natural mineral discovered in LDHs. They can be prepared by coprecipitation method, induced hydrolysis, and salt-oxide method. Some experimental parameters, such as temperature in the reactor, pH, concentration of metallic salts solution and alkaline solution, flow rate of reactants, ageing of precipitate, are important parameters in the preparation of LDH by coprecipitation. Other parameters, such as addition rate, stirring method, geometry of the reactor including reactants injection pipes, are less important parameters. Feitknecht had pioneered the study of hydrotalcite and LDH has well reviewed in a recent book edited by Rives  covering from synthesis, post-modification, structure, and characterization to wide applications. Hydrotalcites as an acid scavenger to inactivate residual catalysts in synthetic polymer is commercially available , where particle size and shape as well as anion exchange capacity are the properties interested in. The maximum theoretical anion exchange capacities of 2.8 meq/g was hardly achieved in most cases but in some cases experimental value exceeded the theoretical anion exchange capacity. Parker et al. have pointed out that the high selectivity for carbonate anion prevent LDH to be used as an anion-exchange material unless further treatment is made. They measured anion exchange capacities of hydrotalcite in the single and mixed anion solutions by observing amount of anion sorbed by freshly fired hydrotalcite. They have compared relative preference of anions after 24 h as SO42-> F-> HPO42->Cl->B(OH)4->NO3-. Anion exchange capacities of calcined and uncalcined hydrotalcites have been studies for CrO42-, SO42-, and Cl- anions by Châtelet et al. and concluded that the partial adsorption of divalent anions on the external sites but monovalent Cl anion was not adsorbed on the external surface of HT. High anionic exchange capacity and high temperature resistance are the advantages compared to organic anionic exchangers. High sensitivity of LDH to moisture, makes it easy to absorb water as well as CO2 in air and the presence of CO32- as the interlayer anion have known to limit the anion exchange reaction before heat treatment . However, commercial LDH has CO32- in the structure, and the amount of CO32- in the interlayer seemed not to limit its applications as an anion exchanger. The anion exchange mechanism has been known to be anion exchange for the anions in the layered structure. 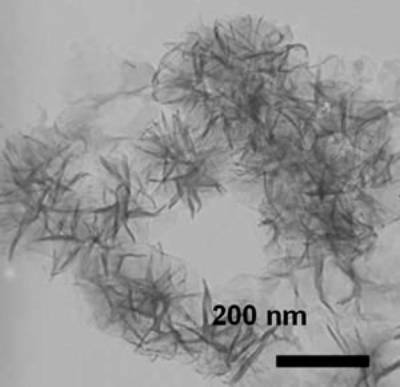 One more mechanism in the case of fired (calcined, or heat treated) LDH, which has no longer layered structure but mixed oxide structure is the reconstruction reaction, which is so called “memory effect”. This one still uses anion sites in the layered structure. 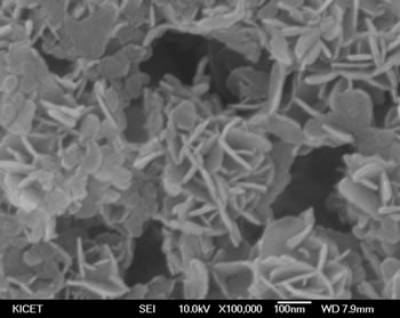 The anion exchange capacity has been affected by anion species in the interlayer and the layer charge or ratio of divalent and trivalent metal ions, however, there has not been found the dependence of compositions, crystallinity, morphology or particle size on the anion exchange capacities. In this study, [Mg-Al] LDH were synthesized with final Mg/Al ratio of 2~3 by coprecipitation method. Change of Mg/Al molar ratio in the starting materials, ageing temperature, and hydrothermal reaction as post treatment have been studied to examine their effects on crystallinity, morphology, particle size and anion exchange capacity. LDH of magnesium with aluminum ([Mg-Al] LDH) were prepared by coprecipitation of mixed metal acid solution and base solution. Mg(NO3)2⋅6H2O(99%, Yakuri, Japan) in 250 g distilled water and Al(NO3)3⋅9H2O(98%, Junsei, Japan) were dissolved in 250 g distilled water respectively and mixed for preparation of acid mixture solution. Sodium hydroxide and sodium carbonates were dissolved in 250 g water and also mixed for base solution. For examination of Mg/Al molar ratio change effect on the product, Mg/Al molar ratio of the starting acid solution was changed as 2.0, 2.5 and 3.0. The control of pH was adjusted to pH 10 when the acid and base solution was mixed. 200 ml of water in the reactor from the beginning of mixing helped for the initial pH adjustment. The sharp needle was used for fine drop of acid and base to fine tuning of pH. After mixing the acid and base solutions with addition rate of about 10~15ml/min, acid solution was used up first and some base solution was left over. pH was kept constant during the course of ageing at 25, 80, 150°C, respectively. After washing the precipitates by ultramicromembrane (Chemicore, Korea) to drop pH under 9, the precipitates were dried in the oven at 100°C overnight and well kept in a desiccator since they have known to have high adsorption capacity in air. Particle properties, composition, morphology and particle size were characterized by ion coupled plasma optical emission spectrometer(ICP-OES), Carbon/Sulfur determinator (CS-2000, Eltra Gmbh), Scanning electron microscope (SEM) (SM-300, TOPCON), Transformation electron microscope (TEM) (200kV, JEM-2000EX, JEOL) particle size analysis (ELS-8000, Photal, Otsuka Electronics) and BET(ASAP 2010, Micrometrics). Thermal and dehydration/rehydration behavior were studied by thermo-analytical methods, (Thermo Gravimetric-Differential Scanning Calorimeter) (TG-DSC; STA409C/3/F. Netzsch) and Thermo Gravimetric - Mass Skimmer Coupling (TG-MASS; STA-MS-Skimmer, Netzsch). The structure of materials was characterized by X-ray diffraction (XRD; MXP, MAC SCIENCE) and Fourier transform infrared spectroscopy (FT-IR; Prestage21, Shimazu). Anion exchange capacity has been tested with LDH after drying at 150ºC and/or heat treatment at 450ºC. 0.01N and 0.1N NaCl solutions were prepared using decarbonated water to cover low and high Cl concentration ranges for the measurement of anion exchange capacity. The concentration of Cl ion and pH of the 100 ml NaCl solutions with 0.1g LDH samples were carefully monitored using ion selectivity meter (Thermo Orion pH/ISE 710A+) for 24 h. The calibration was done with 100ml of 0.100N, 0.010N, and 0.001N NaCl solutions (Aldrich) after addition of 2 ml ionic strength adjustor solution (Thermo Orion) as indicated by ion selectivity electrode manual. The layered double hydroxide of Mg and Al ([Mg-Al]-LDH) were synthesized through coprecipitation of mixed metal acid solution and mixed base solution of NaOH and Na2CO3. The existence of CO32- speeded up the crystallization of LDH in this experiment which is well known for high selectivity of carbonate in LDH. Control of solution acidity during the course of coprecipitation was important parameter for crystallization of LDH, morphology. Mg-Al-LDH has been well crystallized in the range of pH 8~10.5, and it has been adjusted to pH 10 in this experiments. Above pH 10, LDH still precipitates but particle size and yield were reduced noticeably. We observed Mg/Al molar ratio of the LDH dependence on that of the starting acid solution. It changed as 1.98, 2.44, and 2.80 with Mg/Al molar ratio of 2.0, 2.5, and 3.0 in the starting acid solution. The layered structure was confirmed by their characteristic XRD patterns as in Figure 1. There were slight shifts in major peaks to higher 2θ by lowering molar ratio of Mg/Al, which means decreased interlayer distance and unit cell parameters . It can be attributed to an increase in electrostatic interaction between positive layers and negative interlayers with an increase in their charge. Also it is noticeable that there is splitting of peak at around 35° for Mg/Al molar ratio. This implies a difference in the structure by changing Mg/Al molar ratio. Figure 1. XRD patterns of LDH with different molar ratio (a) Mg/Al=2 (b) Mg/Al=2.5 (c) Mg/Al=3, ageing for 24 h at 80˚C and drying at 100˚C. XRD patterns of LDHs with different ageing temperature in Figure 2 showed more sharp and intense peaks for the powder after ageing at higher temperature, which might indicate the larger grain size of LDH as well as higher crystallinity. 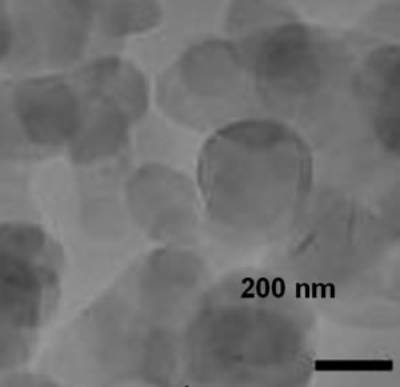 LDH particles prepared with different ageing temperature have different morphology and size as shown in SEM and TEM images of Figure 3 and Table 1. The morphology of LDH powders changed drastically with ageing temperature as shown in Figure 3. Figure 2. XRD pattern of LDH with Mg/Al=3 after ageing for 24 h at (a) 25˚C, (b) 80˚C, (c) 150˚C. Figure 3. TEM and SEM photos of LDH with Mg/Al=3 ageing at 25, 80, and 150˚C. Table 1. Primary and secondary particle size of Mg-Al-LDH powders with Mg/Al=3. 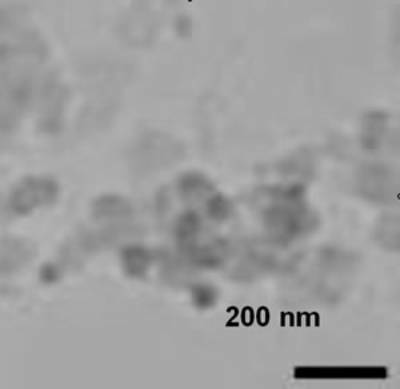 LDH particles prepared after ageing at room temperature showed platelet particles aggregated. With higher ageing temperature, aspect ratio became smaller but less aggregation of particles at 80 °C, however, ageing at 150°C resulted in platelet particles in much larger primary size. The primary particle size of LDH powders is the crystallite size, calculated by Scherrer equation from XRD (003) peak position and FWHM (full width half miximum). They were also compared with primary particle sizes calculated from BET surface area assuming spherical particle shape and direct SEM or TEM observation. The secondary particle size was measured by laser scattering method (ELS-8000, Otsuka Electronics). The effect of hydrothermal treatment at 150°C after ageing 80°C gave different results from direct heat treatment at 150°C. Morphology of the particles were as similar in two samples but the primary particle size calculated by Scherrer equation from XRD peaks and secondary particle size by light scattering was different. The sample with aging at 150°C had been compared with the sample with aging at 80°C and hydrothermal at 150°C. It was observed that the primary and secondary particle size was smaller for the sample with aging and hydrothermal stepwise as shown in Table 1. IR spectrum in Figure 4 shows distinct peaks for O-H at around 3500cm-1, which is O-H stretching absorption. Sharp peaks at around 1400 and 1600 cm-1 correspond to symmetric and asymmetric stretching absorption of C-O and C=O in CO32-, and broad peaks below 1000 cm-1 correspond to Mg-OH or Al-OH stretching absorption. More clear splitting and shifts to higher wave number in smaller Mg/Al molar ratio sample was observed. Figure 4. FT-IR spectra of LDH with different mixture mole ratio. A: Absorption spectra of -OH. B: Absorption spectra of H2O. C: Absorption spectra of -CO32- structure. D: Absorption spectra of [Metal]-OH stretching. The changes in the surface area is interesting. Though the primary particle size calculated from XRD was smaller with decreasing ageing temperature, the BET surface was the largest for the LDH after ageing at 80°C, since the particles aged at 25°C was aggregated in spite of thin platelet morphology. Higher the ageing temperature is, smaller the BET surface area in general, except for the 80°C ageing sample. Thermal and dehydration/rehydration behaviour was studied by thermo-analytical methods, TG-DSC and TG-MASS. The structure of materials were characterized by XRD and FT-IR at each stage of interest. Typical TG-DSC curve in figure 5 showed weight loss around 100°C from evolution of surface water, around 250°C from water in the layered structure, and large weight change around 400°C from carbonate. In the DSC curve, the CO2 evolution peak at around 400°C moves to higher temperature with increasing ageing temperature including the samples after hydrothermal treatment. However, how their structural change effect anion exchange property is still unclear. Figure 5. TG-DSC curves for LDH with Mg/Al=3 after ageing at 80˚C. Heat treatment at 450°C for 30 min evolves carbonates in the layered structure so that its layered structure collapsed to give no more XRD patterns as typical LDH but broad and minor peaks around 35 and 43° as shown in Figure 6. Surface area was increased from 146.4 m2/g to 173.6 m2/g by heat treatment, and we believe it was due to the surface texture change, They have more pleated texture(honeycomb like) on the surface by heat treatment as shown in Figure 7. The FT-IR confirms the removal of water and CO32- by definite reduction in the absorption peaks around 3500 cm-1, 1400 cm-1 and 1600 cm-1. However, its structure was easily reconstructed by rehydration or even by simple exposure to air, since it has high adsorption ability for water. TG-MASS analysis revealed distinct peaks for emu 18, 44, 46, which implies that the evolution of water, carbonates, and nitrates. There might be some nitrates incorporation in the layers but the contents of nitrates inside the layers might be minor even if they co-exists. Figure 6. XRD patterns of LDH with Mg/Al=3 before and after heat treatment at 450˚C after ageing at 80˚C. Figure 7. 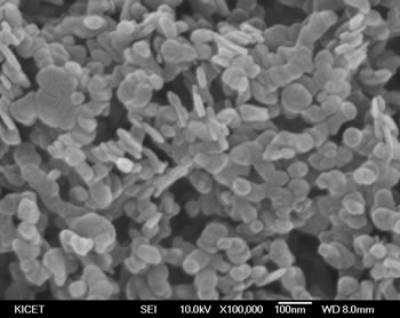 Comparison of SEM photos of LDH (a) before and (a) after heat treatment. Sampling was done in the condition of alcohol dispersion. Figure 8. FT-IR spectra of LDH (a) before and (b) after calcinations at 450˚C for the samples dried at 80˚C. Anion exchange capacity was clearly observed for LDHs after heat treatment at 450°C. Cl concentration was decreased and in some cases larger change than the expectation from maximum theoretical anion exchange capacity. It might be explained by surface adsorption in relatively higher concentration of NaCl solution. pH change was more drastic in the samples with heat treatment. (Figure 9) No matter what the concentration of electrolytes containing anion to remove, pH change was larger for the samples after heat treatment and with lower ageing temperature in the case of samples without heat treatment. There were not only anion consumption for reconstruction of layered structure but also proton consumption for changing mixed oxide to mixed hydroxide. Table 2. Change of pH and amount of Cl anion adsorbed by LDHs prepared with different ageing temperature (a) before and (b)after heat treatment at 450˚C when they are exposed to 0.01 and 0.1N NaCl solution. Figure 9. pH change of NaCl solutions when LDH were exposed to 0.1 and 0.01N NaCl solutions. LDH samples with different ageing temperature (a)before and (b) after heat treatment at 450˚C. In spite of decrease of Mg/Al molar ratio which is expected to increase the inter layered amount of anions , the anion concentration under test did not change as expected. That is due to the mechanism of anion reduction. In the low concentration of anion, exchange through the layers could be the major mechanism for anion reduction but in the higher concentration of anion, the adsorption on the surface as well as exchange through the interlayer seemed to be dominant mechanism for anion reduction. Effectively, surface area, size or crystallinity could be an important factor for anion exchange capacity measurements. We investigated the crystallinities, morphology and anion exchange capacities of Mg-Al-LDH with varing Mg/Al molar ratio and ageing temperature. Higher ageing temperature lead to higher crystallinity and larger primary particle size but the secondary particle size was smallest for the sample with 80°C ageing. Anion exchange capacity was under detection limit in these experiments for the samples without heat treatments but acidity of solution changed. Especially the pH changed to a higher value with lower ageing temperature. It might be due to surface dissolution for small size of particles. LDH samples after heat treatment at 450°C revealed anion exchange capacity and larger pH change compared to LDHs without heat treatment. For the higher Cl concentration, larger anion concentration change due to some contribution from surface adsorption as well as anion exchange in the layer. This work was financially supported by the Next Generation Project, MOCIE, Korea. 1. A. de Roy, C. Forano and J.P. Besse, “Layered Double Hydroxides: Synthesis and Post-Synthesis Modification” in Layered Double Hydroxides: Present and Future (Ed. V. Rives), Nova Science Publishers, Inc., New York, (2001) pp. 1-37. 3. L. M. Parker, N. B. Milestone and R. H. Newman, “The use of Hydrotalcite as an Anion Absorbant”, Ind. Eng. Chem. Res., 34 (1995) 1196-1212. 4. 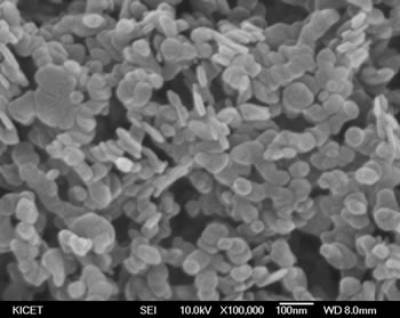 L. Châtelet, J. V. Bottero, J. Yvon and A. Bouchelaghem, “Competition between Monovalent and Divalent Anions for Calcined and Uncalcined Hydrotalcite: Anion Exchange and Adsorption Sites”, Colloids Surfaces A: Physicochem. Eng. Aspects, 111 (1996) 167-%%%. 5. A. Beres, I. Palinko, I. Kiricsi, J. B. Nagy, Y. Kiyozumi and F. Mizukami, “Layered Double Hydroxide and their Pillared Derivatives – Materials for solid base catalysis; synthesis and characterization”, App. Catal. A: General, 182 (1999) 237-247. 6. K.-W. Hyung and Y.S. Lee, “Physico-Chemical Characterization of the Layered Double Hydroxide as Pillar Host Material, J. of the Kor. Ceram. Soc., 35 (1998) 445-450. This paper was also published in print form in “Advances in Technology of Materials and Materials Processing”, 6 (2004) 218-223.